On September 16, 1890, Louis Aimé Augustin Le Prince boarded a Paris-bound train, his first stop en route to New York to present an amazing invention that would radically change the way people saw the world. Not only did Le Prince never reach his destination but his body (which seemingly vanished overnight) was also never found despite exhaustive inquiries by the police. Fortuitously, his legacy – a camera that recorded the first motion picture – seized the imagination of kindred spirits who saw the device’s enormous potential as a medium for mainstream entertainment. 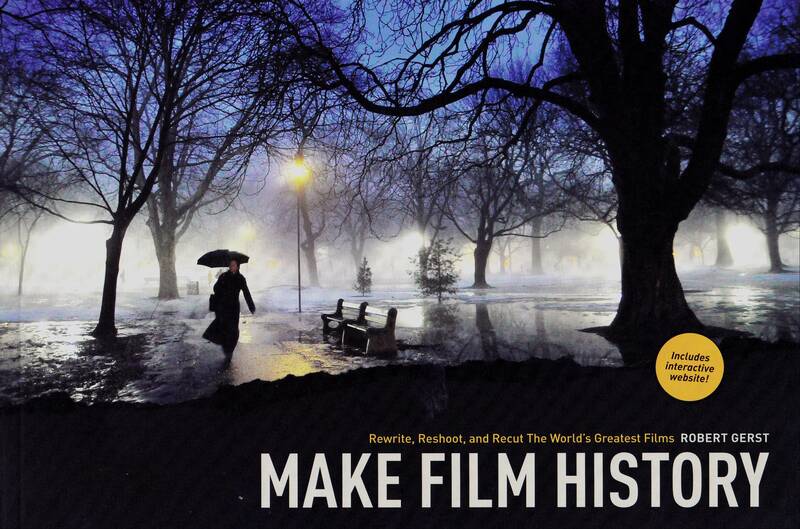 In his remarkable new book, Make Film History, author and film expert Robert Gerst, PhD. invites aspiring moviemakers of all ages to learn from the techniques of 25 cinematic game-changers over the past century and recognize how to apply the innovative lessons of sound, color, texture, music and editing to the development of their own projects. Q: What ignited your passion for movies and what’s the first one you ever remember seeing? In what way(s) did that first movie “speak” to you? A: High Noon! (1952) is the first film I remember seeing. My mother took me. What she thought a little kid would get out of an adult-oriented revisionist cowboy movie I don’t know, but my mother was someone who ignored what most people conventionally thought. She was willing to go anywhere and try anything. She gave me, I suppose, the capacity to see things my own way. When I viewed the film again a few years ago, it seemed a bit hokey. But when I saw it with my mother, it spoke to me. I remember High Noon, and remembering that movie inspires me to thank my mother for standing by me as I slowly became who I am. I only wish I had told her so while still she was among us. Q: Are there some particular movies that speak to you today? infuses that theme into the tiniest features of the music, the camera angles, the costumes. In Lives of Others, a surveillance man in East Germany begins as a high-ranking officer and ends up, after the fall of the Berlin Wall, a lowly postman. The film ends when he enters a bookstore and reads the dedication in the novel written by the artist he surveilled. The bookstore clerk asks if he should gift-wrap the book. “No, it’s for me,” man replies. Freeze frame. It’s a poignant ending, an ending as affirmative as the final shot of Bicycle Thieves, where the man and his son walk off into the crowd together. Q: You’ve come a long way from the days when you first cut movies standing at a Moviola. What are three high points along the journey that you feel most strongly shaped your approach to inspiring the next generation of filmmakers to go forth and be creative? A: At college, Richard Wilbur, America’s first poet laureate, taught me what I know about poetry, and writing poems and stories and novels—all safely tucked away now in a drawer—taught me how to write prose. Students I taught in a classroom at Mass Art taught me that people learn by doing. Fatherhood invested me in the next generation. Q: What would prospective film students be the most surprised to learn about you? A: I never went to film school. My film school was bird watching. When you watch birds, you wait and listen. You never know beforehand what you’re going to encounter, so you attend to whatever moves or twitters. That’s the state of mind in which to watch a movie and make one. I recommend bird watching to film students. And I spent a couple of years learning to cut and shoot film. As it turned out, I didn’t become a professional filmmaker. I earned a Ph.D. in literature instead. But hands-on work making movies taught me how the most miniscule change in a line, a shot, and a soundtrack moves a film in a new direction. Q: Make Film History: Rewrite, Recut, and Reshoot the World’s Greatest Films isn’t the first book to be written about film history but it may be among the most distinctive. Tell us why – and how – you went about developing and researching this project. A: I wrote the book to help you unleash your inner filmmaker. “You” probably started with me. The digital revolution reawakened me. When I had practiced filmmaking years before, movie making felt as esoteric as alchemy. But suddenly a filmmaking studio was opening in everyone’s computer. In my computer, I had this second chance to fiddle with movies. The tug I feel, I realized, others also feel. People who once would express themselves in poetry and dance now crank out You Tube videos. Some of them might want to learn about how actors act, how editors mix sounds, how filmmakers in general gestate movies. I proposed an early version of the book and interactive website to Ken Lee and Michael Wiese of Michael Wiese Productions. Michael suggested that I recast the book/webpage introduction to film that I first proposed into a historically oriented introduction to film history and filmmaking. Zelig is that 1983 movie where, with optical printing, Woody Allen, chameleon-like, slips into historic footage from the past. I spent about two years researching and writing. I spent some time in the Margaret Herrick Library of the Academy of Motion Picture Arts and Sciences in Los Angeles and visited the film archives and the restoration school at George Eastman House in Rochester, New York. I thought about the films I was screening for my film history students. I read printed and digital sources, many contradictory. I tried to distill all this lucidly and accurately. Once I submitted the manuscript, I worked for roughly another half year getting the web site to a state where Make Film History readers would find it engaging. On the site, reader’s access historic film clips, view film history photographs, and read related documents. The site features film clips that readers can download to solve or re-solve the question a chapter’s exercise poses. To enable even novices to experience the joy of building a movie moment, the site provides step-by-step editing instructions written for the entry-level software already installed in most computers. Make Film History is a glimpse at twenty-five moments when movies changed. But it’s not an encyclopedia. It’s a love note. Q: I love your interactive website (http://makefilmhistory.com). How did you come up with this and what was the most challenging aspect of developing it as a complement to the book? A: A long ago Mac Plus HyperCard computer game—Cosmic Osmo—inspired the website. Cosmic Osmo was an early attempt by Rand and Robyn Miller to enable people to slosh through a humorous, joyful universe. Later they created Myst, which became so popular newspapers took to printing daily tips to help wanderers in Mystland progress from location to location. I myself never advanced past the Mystland dentist chair, but in my foursquare New England house my wife and son went everywhere. If this sounds like Prospero’s cell, it was. In drawers and under objects you came across what you felt was Osmo’s presence. If there was a higher purpose to this game I never discovered it, but just playing this game unleashed my imagination. I wanted the website for Make Film History to inspire similar feelings. The sequential chapters constitute a path. Clicks take you to outlooks. You interact with film clips in the exercises. I developed the site in stages, first creating the navigation bar, then roughing out the master page for each chapter of the book, then adding content as I thought of it. Beyond the chapter structure, I certainly followed no outline. The pages just grew. They continue to grow. The site runs about 350 html pages today, probably about double what it was when I first put it up. Yesterday I put up a couple of pages about the Brox Sisters of the 1920s and maybe tomorrow I’ll add another page about video on the Internet. I don’t know. Subsidiary pages begin with an image that mesmerizes me. Then I open a blank file and explain what I see in the image. Then I add sound or video for users to activate. I wake up in the morning and rarely know what glen of this forest I’ll be entering. But I know I’ll go somewhere. I use Dreamweaver. I’m bird watching. Q: Okay, here’s something I’ve always wondered about silent movies. We can read on the title cards what the characters are saying but they’re obviously speaking to each other during scenes for which there are no cards. Were silent movies fully scripted or would the director instruct them from the sidelines to “act like you’re upset,” “explain that you’ve lost something,” “convey suspicion,” etc.? A: Silent movies traded in feelings, as music does. But no one feels a comma in an emotion. So no one wrote out scripts for silent films. If you think of a silent movie as a dance, you immediately sense the uselessness of a script. Directors would shout or whisper directions—“Move towards her slowly… Tell her you love her.” Beside the camera, violinists and other musicians often played to summon feelings out of actors. (Garbo favored a violin and cello duet). Directors made very long silent films without consulting a word of script. D.W. Griffith used no script to create The Birth of a Nation. Sometimes, one of his camera assistants asserted, Griffith would step onto the set to dance with Lillian Gish—“Miss Geesh” he called her— and then start shooting. Silent movies are dance or maybe semaphore. Motion makes them. Though they weren’t scripted, most silent films were certainly written. There were two kinds of silent movie writers. One sort created what they called scenarios—story summaries for directors to chop and frame into bits of story played out in scenes. The other sort wrote intertitles. An intertitle was, in essence, a silent movie tweet. You said it fast and you said it first. The first shot of Sadie Thompson is words on a plain black background, “In Pago Pago—in the sultry South Seas—where there is no need for bed clothes—yet the rain comes down in sheets…” That’s title writing. What actors said to each other in silent films they pretty much made up in the moment. Sometimes they said unprintable things. Profusely and obviously, characters cursed each other in What Price Glory?, and lip readers supposedly complained. Usually silent film actors tried to say what they felt their characters would say. Improv actors now work that very way. Q: A recurring theme throughout your book is to “learn by doing” but even more so is the message to “learn by imitating.” Doesn’t this just perpetuate the cycle of reinventing the wheel through remakes, prequels and sequels and, accordingly, becoming predictable? A: You can never predict where an exercise in imitation will take you because, however obvious the destination, the road keeps changing as you travel it: your own hand is always on the wheel. You start out imitating Fritz Lang and, if you’re made that way, Adam Sandler arrives. Michelangelo leaned to sculpt by copying statues from ancient Greece. Imitating teaches technique and it unshackles you. Q: How does today’s movie business compare to what it was like in the past? A: We’ve returned to the earliest years of movie making. It’s as if we’ve stopped the movie history feature mid-reel, rewound it, and George Méliès and the Lumiere Brothers have taken over where Edison left off. The king is dead and the little guy is king. To me, this moment is unbelievably exciting. The twentieth century factory studio has vanished. Studios mainly market films now, not make them. Today, the studio name preceding a film is a Cheshire cat smiling into thin air. An ad-hoc production company of agents, producers, directors, and mother-in-laws actually made the film. In today’s film world, you can shoot a major motion picture with a digital camera. Danny Boyle and his cinematographer Anthony Dod Mantle shot much of Slum Dog Millionaire on Silicon Imaging SI-2K digital cameras. The camera head weighs 1.2 pounds. You can rent one for a day or week at your local video equipment vendor. Used ones sell on eBay. You can edit your movie on your lap top computer using Final Cut Pro. There’s a dark fringe to this brightness. The film business, like the book business, has no clear view of where the industry is going. So people can’t make long-term commitments. In its heyday and even afterward, the studio system was more stable. In a documentary about film editing, film editor Paul Hirsch says that he walked into the editing room and when he looked up, thirty years years had passed. People just entering the film business now won’t experience that. Q: If someone came to you and said, “I want to break into this business,” what would be your three best pieces of advice? 1. “Only connect…” reads the epigraph to E.M. Foster’s novel, Howard’s End. If someone offers you a job, take it. Grip. Sub-titler. Assistant caterer. Whatever. Get yourself an offer. Then take it. 2. Don’t call yourself —don’t think of yourself—as an ARTIST. That’s for someone else to judge. Think of yourself as someone who cuts shots or applies makeup. 3. Live with compassion. May I reblog wisdom Anthony Burgess evidently offered in Inside Mr. Enderby? Laugh and the world laughs with you. Snore and you sleep alone. Q: Technology was quite a bit different even as recently as 50 years ago. What are some of the things that today’s moviemakers – who now have access to an impressive array of high-tech tools – learn from past approaches to lighting, sound and cinematography? A: Watching the light, sound and cinematography in old movies teaches you that there really isn’t any such thing as “progress” in movies. Movies get easier to make and simpler to distribute, but they don’t necessarily get better. Contemporary film making tools are fantastically empowering. Even in software like iMovie, you can transition between shots in about twenty different ways. The great montagist of the 1930s, Slavko Vorkapich, couldn’t achieve more than one or two of those effects because optical printers then were unable to create most of them. But Vorkapich’s montages were diamonds. They express his sensibility, so they continue to communicate, regardless of how dated his films may be. Hearing César express his love for his son in Fanny is affecting, even if the sound track crackles in that early talkie. Watching the early filmmakers teaches you humility. Humility is the great teacher. Q: Have all the advances in eye-popping CGI and 3D come at the expense of weaker plots, poorly developed characters, and contrived dialogue? A: Filmmakers may be de-emphasizing plot, character, and dialogue because movie viewers enjoy all kinds of things that CGI and 3D do well. Filmmakers seeking markets abroad find that memorable dialogue doesn’t translate well. Other elements of a movie—like action— travel better. In a comic book adaption I viewed this spring, the hero kept endlessly slipping in and out of his CGI skin. I struggled just following the story, but millions of people love this film. The plot conforms, I’m sure, to the three-act structure paradigm that everybody quotes: Something bad happens. Something even worse happens. You deal with it. This movie almost certainly underwent an exhaustive plot point analysis to guarantee that, on page twenty, action required by the three-act formula happens. Good story bones must be there. But when I left the theater, I couldn’t remember what the movie was all about. That movie is earning prodigiously. In two months, people in America and elsewhere have coughed up four hundred million dollars to view this film. That’s a pretty compelling reason to keep making movies like that. Save us, please, from the culture police. But I confess, my heart isn’t there. May I float a possibly heretical thought? Plot may not be the be all and end all of movies. People have all kinds of reasons for enjoying performances. Spectacle can often be enough. Masques had minimal plots in the seventeenth century. Movies of the future may not be stories at all. In Brave New World, Aldus Huxley looked into the future and, instead of movies, he saw “feelies.” CGI spectacle movies may be moving the mainstream business closer to the non-narrative poetry of the avant-garde. CGI and 3D do not portend the end of movies. Martin Scorsese’s 3D Hugo, for instance, was beautiful. Q: Many a black-and-white film has been colorized in an attempt to give it less of an “old” feel. What’s your reaction to this practice and what, if anything, do you feel gets lost in the transition? A: The actual number of movies colorized is miniscule. Of the thousands of films made by professional filmmakers since 1895, about two hundred seventy black and white movies—roughly one hundred sixty of them from the 1930s—have been digitally colorized since the early 1980s. For me, even one is too many. I understand why people who own rights to old black and whites consider colorizing them: many people today say they’d never watch a black and white movie. Maybe the 2012 Best Picture Academy Award for The Artist converted some of those people. Black and white movies intrigue me as poetry sometimes does. Myth is universally understandable. Poetry isn’t. Poetry exists in a particular language and doesn’t survive translation. “Fuzzy-Wuzzy was a bear…. Fuzzy Wuzzy had no hair. Fuzzy Wuzzy wasn’t fuzzy, was he?” is untranslatable. John Ford’s The Fugitive would be just as untranslatable. Black and white infuses the worldview of that film. When a director uses black and white effectively, colorizing harms his movie. Maybe movies made by visually uninventive directors don’t suffer much from colorizing. But could you imagine Citizen Kane in color? I gather that Jean Luc Godard once toyed with the idea of colorizing Breathless. Thankfully, he didn’t. Q: Your book sets forth the premise that there are 25 pivotal points in the timeline of movie history. What do you predict will be the 26th? A: The book stops at twenty-five points on a continuum. I think of them as freeze frames in a very long take. I’d love a chance to write about others. The Paramount Pictures School of 1925. The last days of 35 mm projection in 2012. It’s endless. As the twenty-sixth, however, I foresee smaller, more modular and haiku-like movies. We’ll return to the ten-minute one reeler standard. Nine-hour movies are over. Twitter already circulates films that run six seconds. Q: Your book contains lots of nifty exercises at the end of each chapter. I’m curious, though, whether a reader has to have extensive experience with digital filmmaking software in order to get the most benefit from the lesson. A: You need to spend a few minutes familiarizing yourself with basic features of the digital editing software installed in your computer if you’ve never done that before. Beyond that, you’re good to go. The exercise instructions are written for iMovie and Windows Movie Maker, and I’ll be putting up Adobe Premier instructions shortly. The exercises work fine in more advanced digital editing software, too. The goal is to unleash the filmmaker in everybody. Q: Some people think that digitizing movie editing, shooting, and projection portends the end of movies as we know them. What do you think? A: I am excited about the future. Ending “movies as we know them” might be a good thing, if what supplants “movies as we know them” is movies we never thought of. Giving more people more ways to experience the joy of making, viewing, and loving movies is an absolute good. Q: Hypothetically, you’re having a small dinner party and can invite any three of the visionary filmmakers referenced in your book. Which three would they be and what question would you put to each one that has never before been addressed in interviews or biographies? A: To David O. Selznick: How did you feel about your father? To Dziga Vertov: Did you really believe that movies can make a new humanity? To Georges Méliès: What do you think truth is? Q: Can learning about movies help ordinary readers— who aren’t going to be movie professionals—live more imaginative and fulfilling lives? A: There is an artist in everyone. We enter dreamland every night. Artists are just people who, when they wake, continue dreaming. Learning about movies induces in you the feeling, as love does, that you are not alone. That is, of course, an illusion. You are alone. But we live by that illusion. Movies are the meeting place of souls. A Striped bass and blue fish, I hope. I’m going fishing. When I finish with that, I’d like to write about husbands and wives who made movies together. Martin and Osa Johnson. Federico Fellini and Giulietta Masina. Phillips Smalley and Lois Weber, for instance, were once the most esteemed movie couple in Hollywood. Now nobody’s ever heard of them. A: Like me on Facebook. Put in a word on my blog. I love to talk movies. It’s not that the editor hates you or hates your story, nor is the editor telling you anything with the dark intention of making your project worse. The goal, first and foremost, is to make it the best it can be and, accordingly, make you an even better writer than you might ever have thought possible. 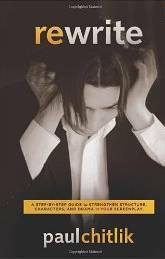 Paul Chitlik, author of Rewrite: A Step-By-Step Guide to Strengthen Structure, Characters, and Drama in Your Screenplay (Michael Wiese Productions) shares his insights on what you can learn from going back to the drawing board. Q: “The best writing is rewriting,” wrote E.B. White. For a lot of aspiring authors, however, any suggestion that their original prose might even remotely contain flaws or inconsistencies causes them to instantly put up defenses and arguments to the contrary. Why, in your opinion, are they so averse to taking their material back to the drawing board? A: First, writing is hard. Writers naturally only want to write as little as they can get away with. While this works in journalism, and sometimes even fiction, it doesn’t work at all in film or television (and I’ve worked in all of them). Sometimes, too, they want to do it “their way.” They feel restricted by the format, which many call the formula. While some good films are made outside of the format (very few Hollywood films, to be sure), most fail that don’t follow the traditional format, which developed for 2500 years in playwriting and then 100 years in screenwriting. We know what works. Why try to re-invent the wheel. Speaking of wheels, think of writing within the format as manufacturing an automobile. You wouldn’t have square tires just because you liked squares or you wanted to be different. You need round tires, an engine, a transmission, a steering wheel, and brakes. But even though you are restricted to four wheels (and sometimes, three, but rarely, though one of my favorite roadsters is the three wheel Morgan), you have a wide range of designs in which to show your originality. A Jetta is very different from a Ferrari, yet they are both automobiles. And if you want to be original, you certainly can: You can make a DeLorean or a Honda Fit or a Nissan Cube with a wrap around back window. But if you decide that you feel restricted by four wheels and want to add a fifth, well, you might find that the old format worked better. But working off of four, you might go to six and find some success. Try the four first, though, and have good reason to add the other two, if that’s what you want. Creating art is a very personal thing, and new writers are not used to the collaborative process that is film and television making. Unless you’re going to write it, cast it, act in it, shoot it, cut it, and distribute it yourself, you’re going to have to collaborate. Get used to it. Q: Which is the more efficient practice (and why): (1) to rewrite after you’re completely done or (2) to rewrite as you’re composing? A: I rewrite the previous day’s original pages before I start a new scene. But I don’t usually go back farther than that unless I need to set up something that I’m paying off in a scene that comes to me outside of the beat sheet. But it’s best to plough through the first draft to keep your focus and then let it rest for a few days or even weeks before tackling the rewrite with a fresh perspective. Q: Okay, let’s be honest, how many rewrites did you do for Rewrite? A: Not including the in-process second edition, I did about five rewrites before I submitted it to the publisher and another two after. Then we both decided it was done. Q: How did this particular book come about and who do you see as its target demographic? A: One of my students in a UCLA Professional Program in Screenwriting class in rewriting sent me the outline he had done of the course and suggested I write a book on rewriting. I thought that was a very good idea since there were no how-to rewrite books. Its target is new writers who don’t have a support system like a professional writer does. A professional can go to his manager or agent, his development executive, his director, even his writer friends for feedback. Someone in Sioux Falls can’t. Also, some professionals feel they need to do a few drafts on their own before going back to the studio, but don’t want to share their work for whatever reason. So they refer to my book. More than one has told me s/he has done this. Q: Tell us about your academic and professional background that prepared you for the challenges inherent in penning a book. I soon got back into writing, starting with a job as an executive story editor on a syndicated show where I supervised upwards of 140 scripts. They were mostly crap (even my own), and I supervised the rewriting of every one of them. Since then, I have written hundreds of television scripts and been commissioned to write over a dozen films (five of which have been made, some under a pseudonym for various reasons). In classes at UCLA and Loyola Marymount University as well as private workshops over the last twelve years, I have supervised the writing and rewriting of something over 1800 scripts! I know what works and what doesn’t. I know the process. The challenge was boiling down everything into less than 200 pages. A: When I started the book or started my career? If it’s the career, I would have started fresh out of school instead of wasted so many years doing other things. If it’s about the book, well, I wish I would have known (but no one did), what the true profit margins are in e-books. I know now and my publisher and I have come to a new agreement. Q: Do you ever go back and read some of the things you wrote earlier in your career? If so, in what ways has your style or focus evolved with age? A: I sometimes go back and read old stuff when I’m looking for something specific that has nothing to do with writing and I find my old work. Some stuff is really bad – no form, no story, just clever wording. Some is just raw emotion. My focus is more on story than on self now. I tend to write about people struggling with an issue instead of me struggling with an issue. A: I did write a couple of plays when I decided to go back into writing in the 1980s. They’re not too bad. What I should have done then, and what I’m doing with a project now, is to shoot the play as a play and get it circulated. It would have shortened the time I spent out in the cold. Q: Let’s talk a bit about the importance of structure in a screenplay. So many writers simply jump in and start tossing elements about without any preconceived game plan about how to make them coexist and move the story forward. Why is structure a critical factor and what are some examples of movies where structure was clearly nonexistent? A: Structure doesn’t restrict, it frees you to explore. It’s a road map. Nobody says you have to follow it, but it will be hard to get to your destination without it. Still, you can go down dirt roads if you want to, but if you don’t know where you’re going, you’re probably not going to get there, wherever there is. With a structure, you always have the option to take a diversion. Without structure, all you have is wandering. Look at Tree of Life or Cloud Atlas or Melancholia. But only if you have to, because I’m still trying to get back those lost hours. They make little or no sense. Yes, they’re beautiful films, from an aesthetic point of view, but there’s a reason millions didn’t flock to see them, and it’s unlikely that you’ve seen all three, but you have my sympathy if you have. Q: Is too much focus put on crafting the hero and, thus, neglecting the attributes and motivations of the antagonist that opposes him? A: A good film has a balance. The antagonist must be 110% as smart, as strong, as handsome as the protagonist. The more interesting he or she is, the more challenging, and, yes, the more human, the more we care about the challenges s/he presents to the protagonist. The better the antagonist, the better the film. The protagonist must have barriers that are real. If they’re not, if they’re not difficult, then we lose interest. Q: What role do you believe the central emotional relationship plays? A: The central emotional relationship (the love object, the person with whom the protagonist must either create or mend a relationship) serves to humanize the protagonist, to give the audience someone else to cheer for, and to give the audience an emotional reason to root for the protagonist. In a romance or romantic comedy, even in a buddy film, this is the only reason to see the film in the first place. Q: Screenwriting is both an art and a science in which storytellers strive to deliver a compelling visual while, at the same time, adhering to the rules and protocols of formatting, time constraints and available resources (including budgets). If you want to break the rules – or make brand new ones that others will want to follow – how do you go about accomplishing that? A: First you must know and be able to employ the current rules. Then you can break them for effect, especially in formatting and editing. But even if you do something different, such as the found footage film I did for UPN in the 90s, Alien Abduction, which was the precursor for Blair Witch and Paranormal and its imitators, you still need to tell a story. That is, there’s a person, he has a goal (wants something), but there’s a rock between him and the goal so he has to go over, under, around, or through the rock to get to the goal. That’s the only rule you can’t break. All the rest are up for grabs, so long as you tell a good story. Even the order in which you tell it doesn’t matter (See Memento, which has one story going backwards and another going forwards – both following, in their way, traditional structure.). Q: What are some movies that were either successful or mind-numbing failures insofar as coloring outside the lines? A: See above examples of films I wish I hadn’t seen. Films outside of the usual are Moonlight Kingdom, Amour (though I would argue it does follow traditional structure in some ways), Groundhog Day (though, again, I would argue it’s right on course). Can’t remember any more off the top of my head, but will probably think of one just after the interview comes out. Q: Legend has it that – amongst the plethora of diverse jobs you’ve held – you once joined a circus sans skills but just because you wanted to write about it. What did learning how to put up and take down the tent for a three-ring circus teach you about yourself, about life, and about Hollywood? A: Whoa! Big question. First, it taught me to be bold. They had to hire the people that the Employment Development Department had sent over, so I wasn’t picked. But I told the foreman, on the sly, that I’d work for free. It told me to be bolder when I could. It had rained the day before and we were literally up to our ankles in mud. Many quit. I did not. I persisted. When the foreman asked if I would stay on, I said, “Yes, if you pay me.” He agreed to pay from that moment on. “No, from the first minute this morning.” He agreed, and I ended up setting up and striking the tent several times in the course of the next few weeks. The next summer, when I showed up, this time with leather gloves because I knew how to prepare myself, he took me on. That time I just did it for fun. I learned I could do just about anything I wanted, and if I did it well, people would pay me for it. I learned that it’s better to do something hard that’s fun than something easy that isn’t. After all, I worked alongside elephants that helped put up the tent. I gained some self confidence. Once I had to climb to the top of the tent from the outside to repair a seam problem. If I could do that, I certainly could work with a studio executive or a cranky actress. Q: What personal or professional accomplishment are you the most proud of and why? A: Still most proud of some of the episodes I worked on for The New Twilight Zone. We had the freedom to do what we wanted with very little interference. As a result, my writing partner and I were nominated for a WGA Award. I would dream of something at night, come in the next morning, and we would write it. What’s better than that? A: I’ve written a three-part, goes-against-traditional-structure, script that I plan to shoot using a four camera set-up on a sound stage, much like a television play from the Golden Age. Something shot like Marty or Requiem for a Heavyweight. Script’s done. Date’s set. I’m now raising the money and getting the crew and cast together. I’ll direct this time, so I’ll have no one to blame if it goes wrong. A: I’d like them to know how tough it is, that screenwriting is not for the faint of heart nor the thin-skinned. Not only do you need to be talented, you need to be persistent and patient. And it helps if you’re independently wealthy and not worried about money. But if you have talent, practice, drive, and confidence you may be able to make a living at it. And maybe change the world a little bit. To learn more about the author, visit http://www.rewritementor.com.